*Editor’s Note 2/25/16: I’m sad to report that 69 Bayard has permanently closed. 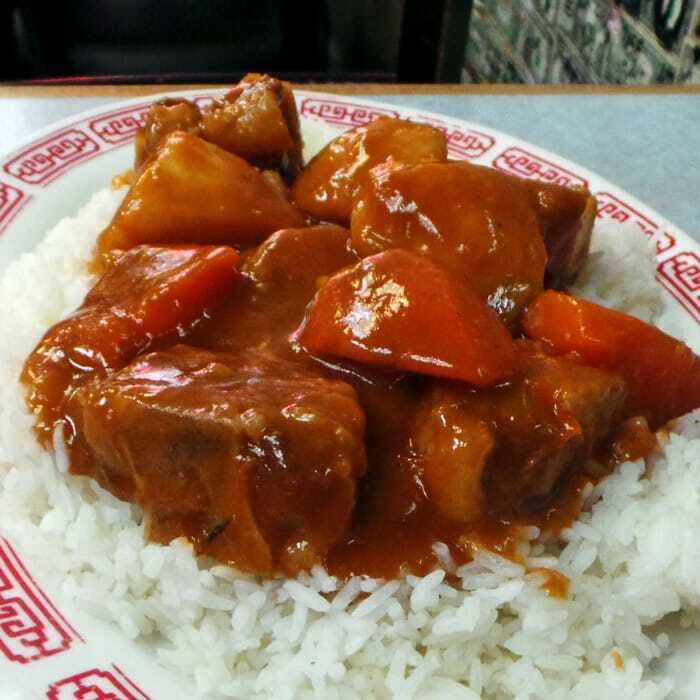 In Chinatown, you’ll find a ton of restaurants serving a wide array of mostly Asian cuisine. 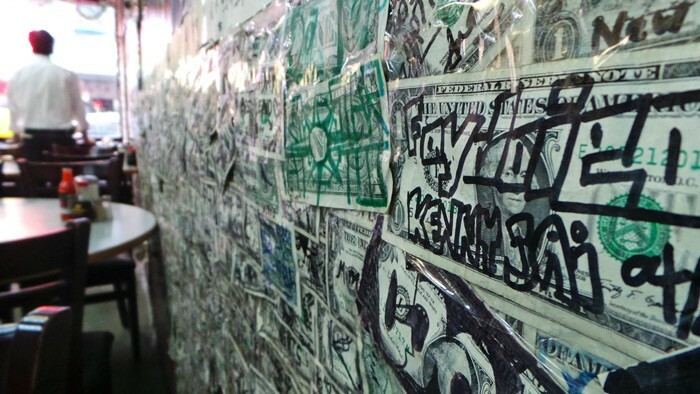 Right in the chaos of it all, on Bayard Street, you’ll find a strange, tiny place called 69 Bayard. I must have walked by this place a million times without considering to stop in to check out their food. Maybe it’s because they don’t offer a lunch special. Maybe it’s because I’d never heard anything one way or the other about it. 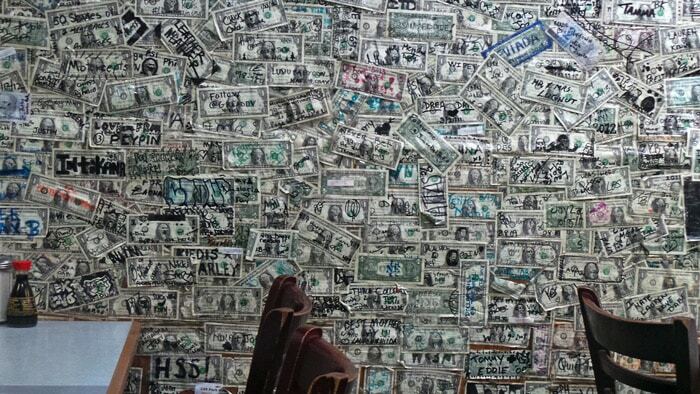 Probably it’s because of the decor, which I suppose could be viewed as either a plus or a minus to some. On this thankfully slow day at work, the weather was absolutely perfect so I decided to take a leisurely lunchtime stroll over to Chinatown and try something new. 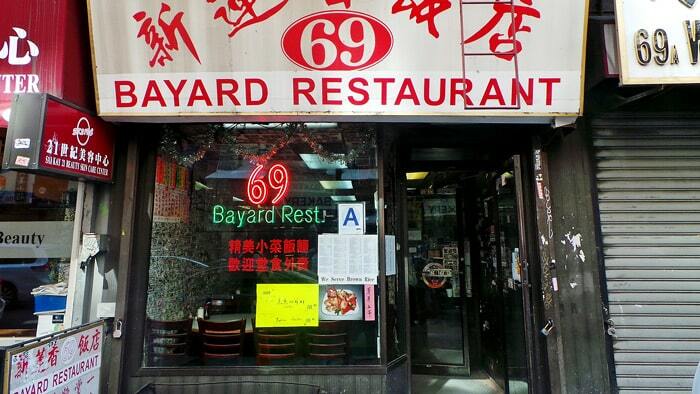 After digging through my to-do list, I noticed I had saved 69 Bayard Restaurant because of a post on Serious Eats. The list suggested that I should try the off-menu Oxtail over Rice at 69 Bayard. I love a good oxtail dish, so it seemed like a great idea to me. I walked over to Chinatown and entered the restaurant. 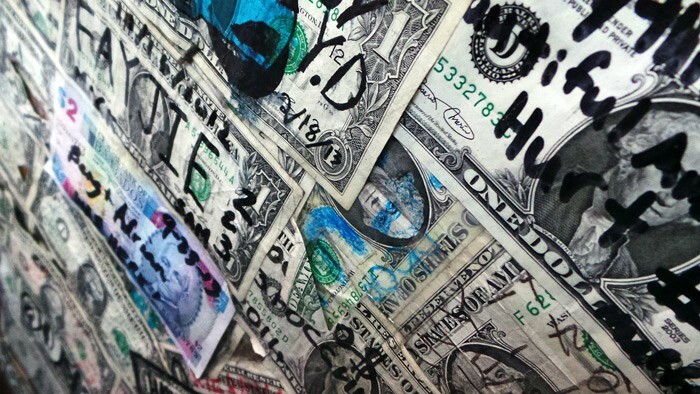 Oh yeah, now I remember, this is the place with all the signed dollar bills covering every square inch of the restaurant. The walls: covered. The ceiling: covered. The security camera: you know it. I’m not sure how this even came to be, but I think it’s pretty interesting. I’m not sure it makes it a more appealing place to eat in, but for novelty’s sake, it’s kinda cool. When my waiter came over to take my order I asked him if they have oxtail over rice since it’s not actually on the menu. I saw his eyes perk up and can imagine his thoughts… ‘this white boy wants oxtail? Is he sure he knows what that is?’ He cautiously asked me “You like oxtail?” to which I insisted ‘Yes, I really like oxtail and would like the dish”. 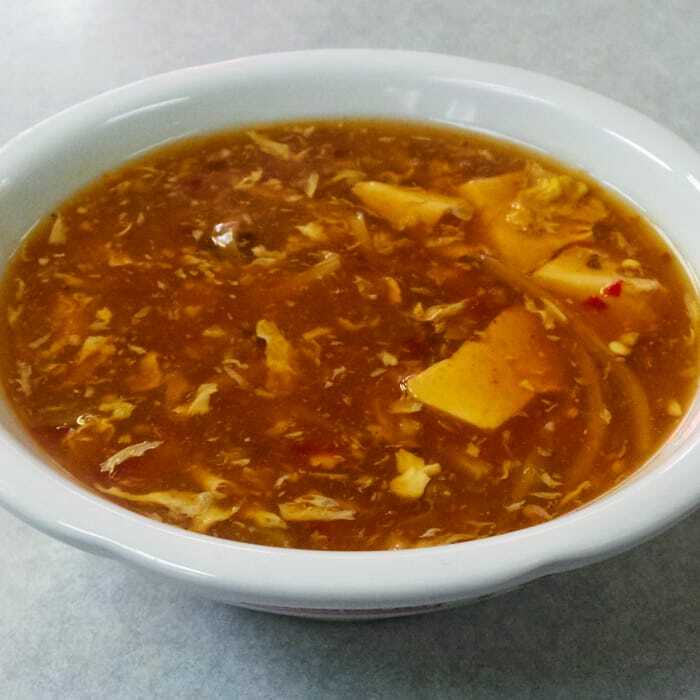 I also decided to give their Hot & Sour Soup a shot since it’s a dish that varies very widely between every restaurant, but that I tend to like no mater how it’s prepared. Almost instantly after placing my order, a large bowl of yellowish soup came out from the kitchen. The color was definitely unusual for the type of soup, but I found that there was no need to worry. It definitely leaned more towards the sour direction than hot although a bit of spiciness did creep up towards the end of the bowl. It was a very thickened, almost gloopy soup, likely due to the inclusion of corn starch, but I enjoyed the bowl nonetheless. Shortly after, an enormous plate of rice topped with meat and vegetables arrives. It seemed to be smothered in a sort of brown gravy. Interesting… this certainly didn’t look Chinese. I started by tossing the entire plate to spread the gravy evenly throughout the dish and take a bite of the gravy-laden rice. Interesting… this certainly didn’t taste Chinese. I took a bite of the oxtail and am now very happy to tell you how incredibly tender that oxtail meat was. It easily shredded and pulled off from the bones mixing very nicely with the rice and gravy. There was also large hunks of stewed potato and carrot in the mix, which added to the non-Chinese-ness. This dish’s flavors and textures really reminded me of my dad’s (very non-Chinese) stewed brisket. It was a very comforting dish, but I had kind of wished that the gravy had more spices and was more flavorful. I ended up shaking in a bunch of the Louisiana hot sauce from the table into the gravy to punch it up. Yup, there was Louisiana hot sauce on the table in a Chinese restaurant. I don’t think this Chinatown spot will become a favorite, but it’s certainly one I will consider late-night since they are open 24 hours. The oxtail is very tender, but I wish all of the flavors were bolder. Perhaps I’ll try their actually Chinese menu offerings next time.